What is the bend radius of a cable chain? The bend radius of a cable chain determines how much the chain bends. It is the distance from the centre of the bend to the centre of the link. In the picture below it is the distance - r.
Fully enclosed steel conduit, suitable for short travels. 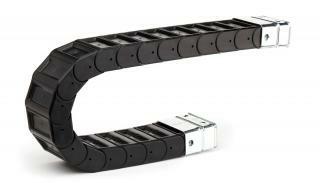 Hybrid cable energy chain ideal for demanding long travel applications. 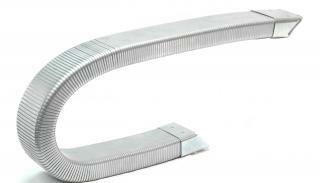 Plastic chain links provide flexibility aluminium stay bars provide strength. Suitable for energy chain applications with larger cables or hoses. Robust plastic cable energy chain. Suitable for high protection and in environments where impact protection is desirable. Fully enclosed version only. Available in multiple sizes. Hard wearing plastic chain, suitable for long travels.